Guess Capcom legend Keiji Inafune wasn't kidding around when he said he hated his job : the Capcom exec said today he's leaving the company he's been with for 23 years at the end of the month. His full job title had been Head of R&D Management Group, Consumer Games R&D Division and Contents Management Division (phew). In a blog post titled "Sayonara", Inafune explains why. "Mr. Inafune submitted his resignation on Tuesday October 19th. His resignation is effective from the end of November, but given outstanding vacation time he will leave the company at the end of October." 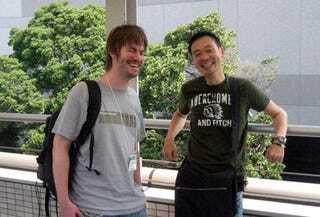 In his blog post Inafune reflects on this 23 years at Capcom. Inafune started out as a character designer but, as he points out, he's now reached the top of Capcom's development structure. "There's nowhere higher for me to go." In an interview with 4Gamer.net, Inafune states that he wants to work for Capcom. "Honestly, the situation has become such that I can't." Inafune could be referring to the reasons he gives in his blog post. However, Inafune has increasingly taken more heat online — especially in Japan — for controversial remarks like stating that the Japanese game industry is "finished". Inafune has also resigned from his position as CEO of Daletto, a Capcom subsidiary. Aside from Mega Man, he is best known for creating (or helping create) other notable Capcom franchises like Dead Rising, Lost Planet and Onimusha. In his post, he gave no indication of what he's moving onto next. Kotaku reached out to Capcom for a comment, but did not hear back before publication.